Loch Lomond is one of the largest landlocked bodies of water in Scotland and covers approximately 27 square miles of land. The loch was referred to in 800AD by Nennius, a Welsh historian who called it ‘stagnum Lumonoy’ and ‘the first marvel of Britain’. 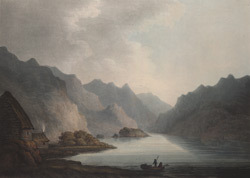 John MacCulloch in his ‘The Highlands and Western Islands of Scotland', published in 1824, wrote the following lines about the loch, “Nothing can well be more striking than the first view of Loch Lomond; its spacious expanse of silvery water, its lovely islands, the rich meadows and trees by which it is bounded, and the distant scene of fading hills, among which Ben Lomond rears its broad and gigantic bulk, like an Atlas to the sky”.